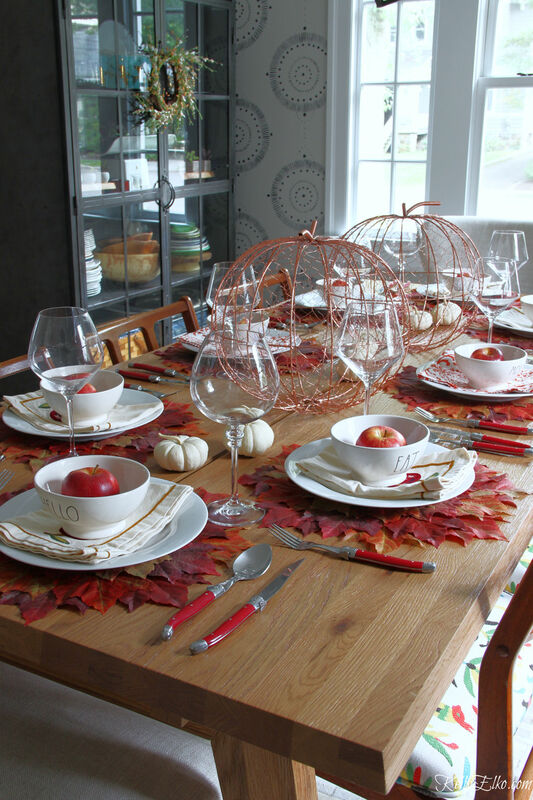 The table is set for a fall feast or Thanksgiving dinner. 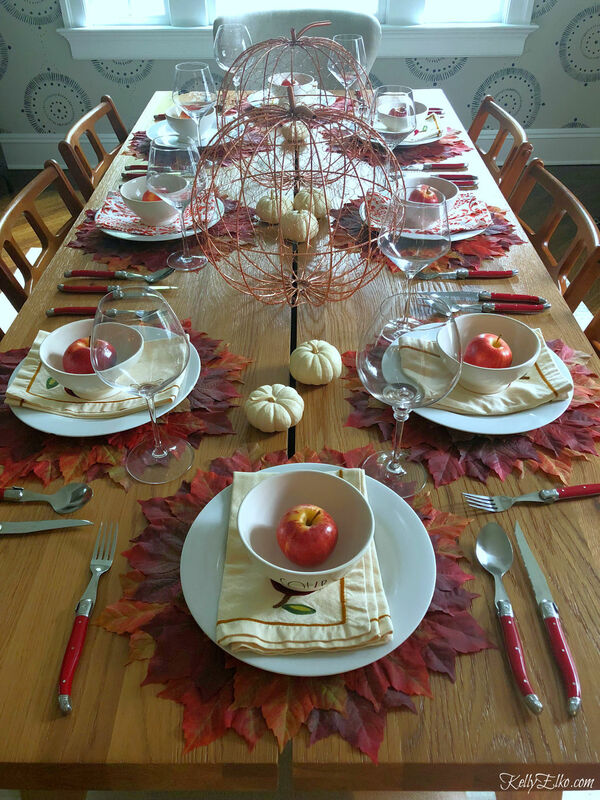 I mixed metals and used apples and mini pumpkins layered over whimsical bowls and colorful leaf placemats to create a fun fall leaves tablescape. I’m especially excited about this Thanksgiving because my girls will be home from college! I plan to make all of their favorites (including that jiggling mass of goodness also known as cranberry sauce in the can)! 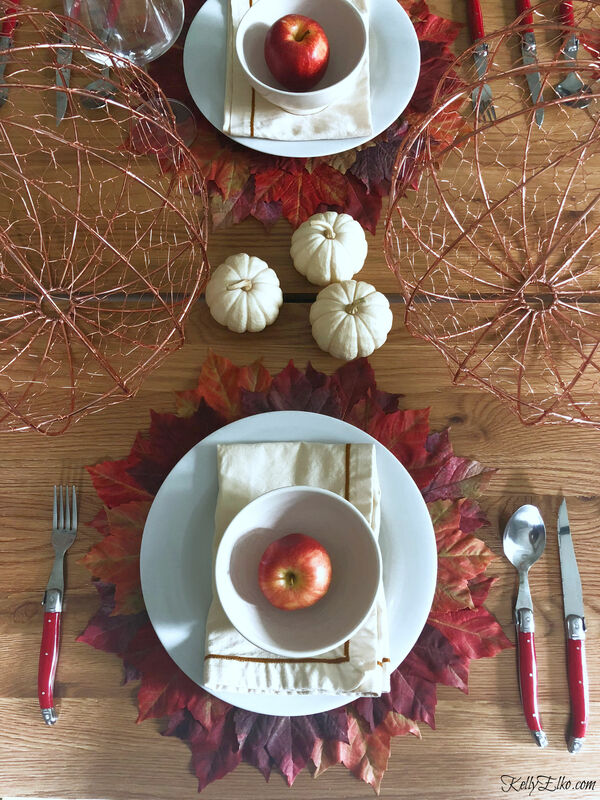 Nothing can outdo the food but I love setting a welcoming Thanksgiving table and I am in LOVE with these fun fall leaf placemats! 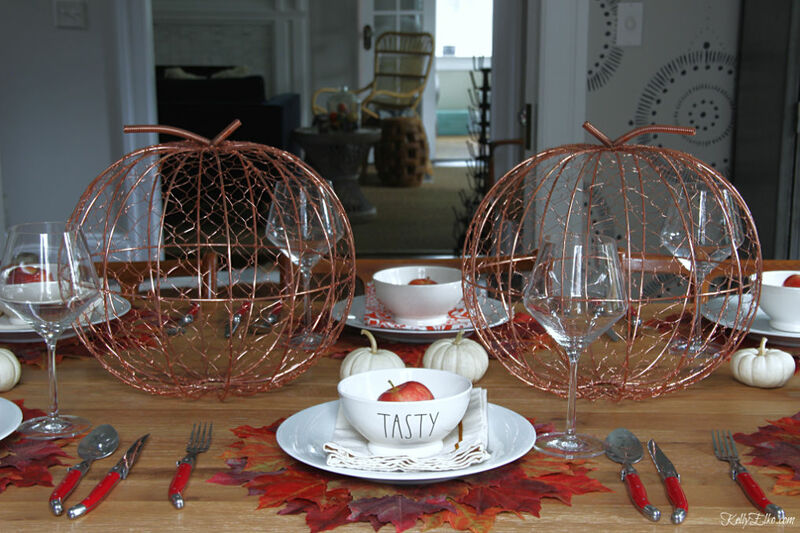 A pair of copper wire pumpkins that I found at HomeGoods and a bunch of mini white pumpkins create a simple centerpiece. I’ll have some more please! 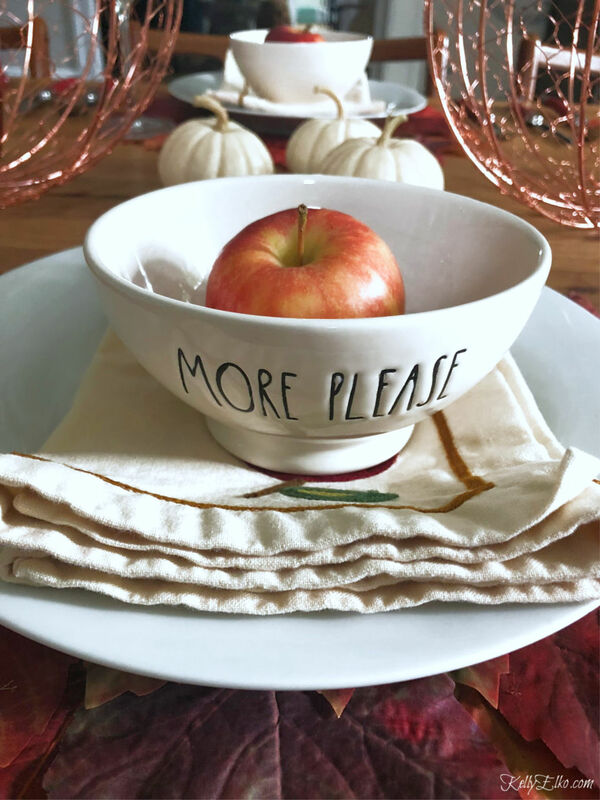 Rae Dunn bowls, each with different words, are perfect for a Thanksgiving feast and my red cutlery is a fun addition. Never be afraid to mix and match. I didn’t have enough of one kind so I mixed in a couple of a different color. I thankful that my girls will be home from college for a Thanksgiving feast! I’m sure after a few months of college cafeteria food, they can’t wait for some home cooking (and lots of hugs from mom and dad)! See more of my fall decorating ideas HERE. P.S. Last Friday was my 7 year anniversary of starting this blog! If you want a good laugh, you can read my first post HERE. I’m on my way over Kelly! That looks so inviting! I’ll make extra mashed potatoes! Congratulations on your 7 years,love your blog. Those pumpkins are so very cute, big and small, i do love this whole table setting. I can’t believe it’s been 7 years – time sure does fly!